To evaluate the hypothesis that a general correlation exists between species range size and dispersal ability, we surveyed mitochondrial cytochrome b sequence variation in three surgeonfish species with vastly different ranges: Ctenochaetus strigosus, Hawaiian endemic, N = 531; Zebrasoma flavescens, North Pacific, N = 560; Acanthurus nigrofuscus, Indo-Pacific, N = 305. Collections were made throughout the 2,500 km expanse of the Hawaiian Archipelago and adjacent Johnston Atoll. Analyses of molecular variance demonstrate that all three species are capable of maintaining population connectivity on a scale of thousands of km (all species global ΦST = NS). However, rank order comparison of pairwise ΦST results and Exact test P-values revealed modest but significantly different patterns of gene flow among the three species surveyed, with the degree of genetic structure increasing as range size decreases (P = 0.001). These results are consistent with mtDNA surveys of four additional Hawaiian reef fauna in which a wide-spread Indo-Pacific species exhibited genetic homogeneity across the archipelago, while three endemics had significant population subdivision over the same range. Taken together, these seven cases invoke the hypothesis that Hawaii’s endemic reef fishes evolved from species with reduced dispersal ability that, after initial colonization, could not maintain contact with parent populations. 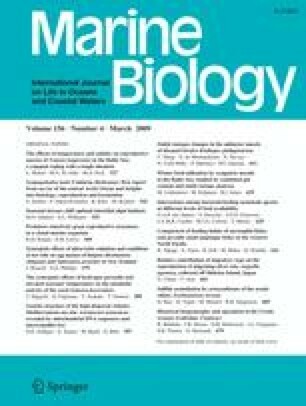 The online version of this article (doi: https://doi.org/10.1007/s00227-008-1119-4) contains supplementary material, which is available to authorized users. We gratefully acknowledge two anonymous reviewers for helpful comments that much improved the manuscript. In addition, we thank the Papahānaumokuākea Marine National Monument, US Fish and Wildlife Services, and Hawaii Division of Aquatic Resources (DAR) for coordinating research activities and permitting procedures, and the crew of the NOAA Ship Hi’ialakai and B. Walsh, B. Carmen, I. Williams, and S. Cotton of Kona DAR for assistance in the field. This work was funded by a grant to B.W.B. and R. Toonen from the US National Science Foundation (OCE-0454873), by the HIMB-NWHI Coral Reef Research Partnership (NMSP MOA 2005-008/6682) and the National Oceanic and Atmospheric Administration, Center for Sponsored Coastal Ocean Science, under awards #NA05NOS4261157 to the University of Hawaii for the Hawaii Coral Reef Initiative. We thank the staff of the Hawaii Institute of Marine Biology (HIMB) Core Facility for providing sequences. The HIMB core facility is supported by an EPSCoR grant to University of Hawaii (EPS-0554657). J.A.E. was partially funded by the NSF GK-12 Fellowship Program (DGE02-32016). Thanks to T. Daly-Engel, L. Sorenson, L. Basch, A. Alexander, M. Craig, L. Rocha, R. Kosaki, C. Musberger, D. White, C. Meyer, M. Gaither, M. Iacchei, G. Conception, Y. Papastamatiou, M. Crepeau, and Z. Szabo for field collections, laboratory assistance and valuable advice. This is HIMB contribution No. 1333. This study complied with current laws in the United States and were conducted in accordance with the regulations of the University of Hawaii Institutional Animal Care and Use Committee (IACUC).